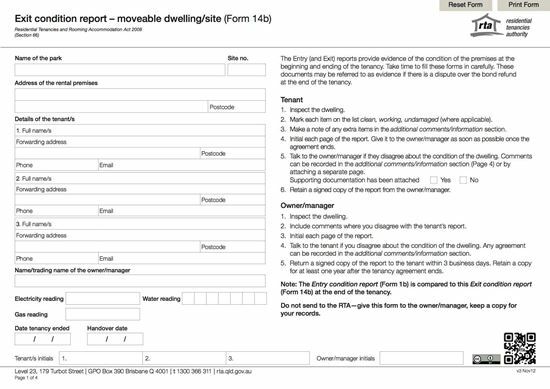 Record the condition of a moveable dwelling / site at the end of a tenancy with this free Queensland Exit Condition Report Form 14b. 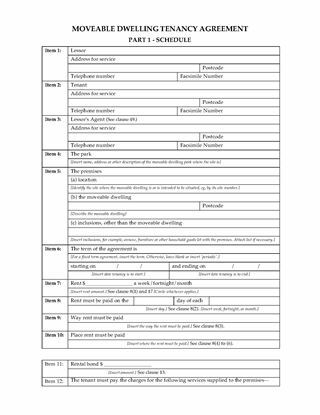 The Residential Tenancies Act requires that at the end of a tenancy where the tenant paid a rental bond, this form must be completed by both the landlord and the tenant during a final inspection of the rental premises. The form is only for moveable dwellings and sites (caravans, caravan parks, etc). The document contains instructions on how it should be completed. 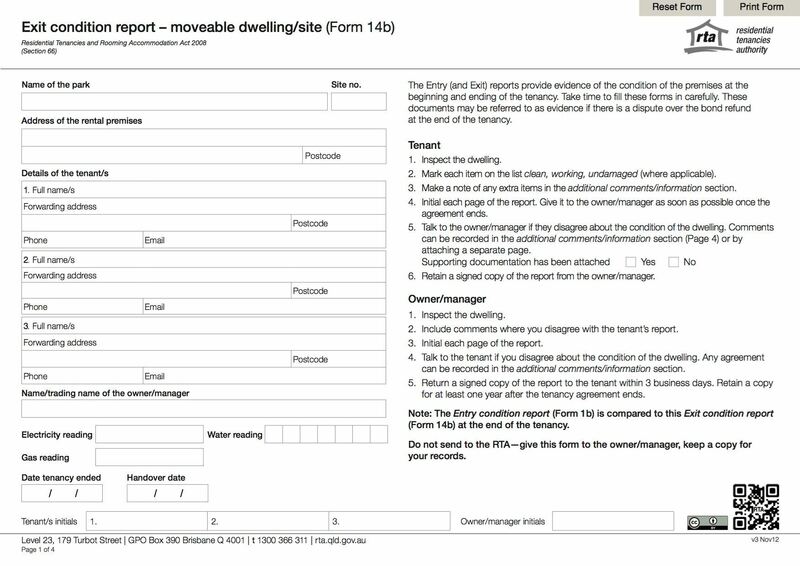 Free Queensland Exit Condition Report - Moveable Dwelling / Site Form 14b, in PDF format. Issued by the Residential Tenancies Authority. Do you have a caravan, manufactured home, or caravan site to let to a tenant? 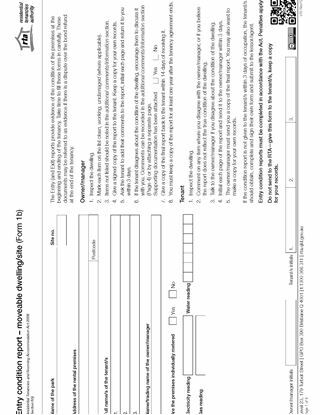 Use this template Moveable Dwelling Tenancy Agreement if the let is in Queensland. The Tenancy Agreement can be used for either a fixed term tenancy (such as 1 year) or a periodic tenancy (month to month, etc.). If there is more than one tenant, each one is responsible for performing the tenant's obligations under the agreement. Procedure the landlord must follow in order to increase the rent, and instructions for the tenant to make an application to the tribunal if the tenant considers the increase to be excessive. The landlord must pay all taxes, rates and levies for the property, except for charges for metered services (electricity, water, etc. ), which must be paid by the tenant. 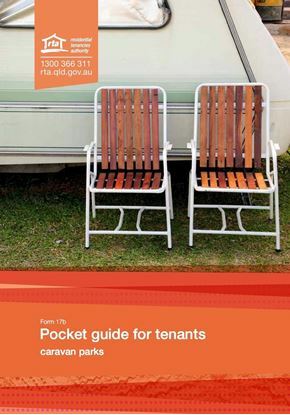 The landlord must provide the tenant with a copy of the caravan park rules, and the tenant must comply with the rules. The Queensland Moveable Dwelling Tenancy Agreement is a standard form digital template. Download yours today.